Miss America’s Outstanding Teen was nothing but a dream to me. After 4 hours of sleep, a 2 and a half hour plane ride, and a workout of pulling 4 large suitcases through the airport, I arrived in the lobby of the Rosen Center. I had no idea that in a short week leaving this building would be one of the hardest challenges I would face. After checking into my room, steaming my wardrobe, and spending two hours on my makeup and hair, I headed down for early check- in, and the official start of my dream come true. I knew that the week ahead of me held many events such as photoshoots, rehearsals, and appearances, but I never would have expected it to teach me so much about myself. I want to start by letting you all know how incredible the other 50 girls competing truly were. As I stood in our first rehearsal I could see the same fire, passion, and courage that each and every single contestant shared with me. Having the opportunity to stand alongside 50 intelligent, compassionate, and inspiring girls from all around the country showed me exactly how much of an impact the MAOTeen organization can truly make. I have never laughed as much as I did in the week spent with my sisters. I feel honored to say that I now have a best friend in each state, and how cool is that?! Aside from my fellow contestants, I was still privileged with the opportunity of meeting many many people who would make my experience that much more unforgettable. As I had mentioned earlier, we were blessed with so many opportunities to make appearances while in Orlando. We did just about everything from playing games and having dinner at ¨Main Event”, to watching a show at “Medieval Times” and walking across the arena with our state flags, but I have never felt my heart beat so happily then when attending the CMNH Dance-a-thon. 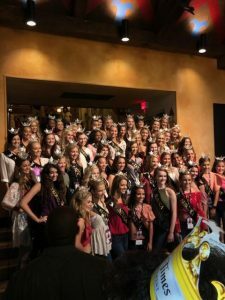 At this event the miss and teen contestants from each state were able to join forces to see how much money we could raise for the Children’s MIracle Network Hospitals across America. 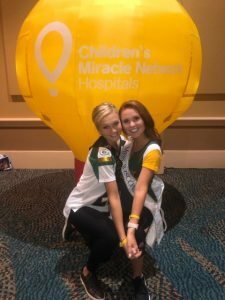 We danced, played games, and had the chance to meet some pretty incredible kids who have been patients in CMN hospitals.I am proud to say that with the combined effort of each state and their titleholders, we were able to raise $35,820 for children all across the nation in need of care. Now the part that most of you are familiar with, is the competition portion of Miss America’s Outstanding Teen. Each contestant competes in four areas of competition including talent, lifestyle and fitness, evening gown and onstage question, and a one-on-one interview, which is my personal favorite. The personal interview is the one time that the panel of judges have the opportunity to sit down with each contestant and learn a little bit about each girl. In 8 minutes, I was able to discuss a few of my political views, passion for dance, hobbies, platform, and so much more. After finishing my 8 minutes I left the room with a smile on my face and a strong desire to begin prelims. The first preliminary competition that I was set to compete in was evening gown and onstage question. Walking across the stage in my bridal elegance gown was a feeling of empowerment and confidence like no other. The next night, as I prepared for my lifestyle and fitness portion of competition, my adrenaline took over and I completed the routine knowing it was the best that I had ever done it. Now if you know me, you know I love working out, but when it comes to push ups, they are my worst enemy. However when doing the push up with in the routine, I felt my inner John Cena take over. My final night of prelims was the one that was the most special to me. It was the night that I performed my talent routine. The day after the state competition, the board and I decided that we would keep my same talent music. The song “I Dreamed a Dream” from Le Mis has always been one of my favorite pieces, but dancing to the beat of the music is an indescribable feeling that words simply cannot explain. What I can tell you all, is what dancing on the MAOTeen stage feels like. I immediately fell into performance mode. Although I grew up performing dance pieces on the competition stage, I still feel myself get nervous and excited before each routine I perform. When the music started, it wasn’t my mind that told my body to start dancing, but it was the music that told my heart to pour itself all over the stage. That truly is the best way to describe how I felt during my performance. I’m always my toughest critic, but that night I was artist instead of an athlete. Boarding my plane 3 short days later was one of the hardest things to do. I knew that the past week had pushed me to my limits, and set higher expectations for myself than I knew was obtainable. I had created memories and friendships with girls who I only knew for a week, but felt like a lifetime. MAOTeen week was not a vacation, but it was a paradise in itself. There was always so much joy even in the times of feeling homesick. I walked away more sure of myself, my mission, and my potential. 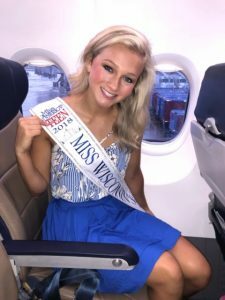 I know that my work here in Wisconsin is not done, and I plan to live each and every moment as Miss Wisconsin’s Outstanding Teen to the best and highest of my abilities.